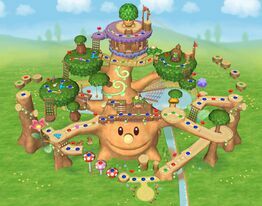 Towering Treetop is a game board from Mario Party 6. It is centered around a large tree, surrounded by a few other trees, and a lake behind it too. The ? 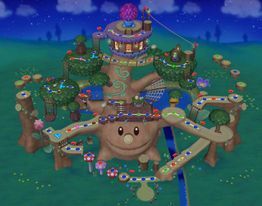 Space behind the start forces the player to use a big feather to tickle the giant tree's nose in order to have it sneeze. If successful, the giant tree lets it out, causing other players to drop to lower parts of the board. The ? Space left of the beehive gives players the choice to ride one of three fluffs for free. Whatever fluff they choose takes them to another part of the board. Landing on one of the three ? Spaces in front of the beehive triggers bees to come out and sting the player. Players lose coins depending on how many bees sting them. The ? Space at the top of the board has two functions, depending on what time of day it is. If it is day, the player sees Woody, who showers coins on all the spaces and players. If it is night, he is replaced with his counterpart, Warukio, who makes Spiny eggs rain down on all spaces and players, who lose coins during the shower. Other things happen depending on the time of day too. During the daytime, the pink flower at the left of the board is in bloom allowing players to reach to the spaces they wouldn't be able to get to by night. At night, that flower closes up, and the purple flower at the right side of the board blooms, allowing players the path that is inaccessible during the daytime. Pink Boo is also ready to give her services to someone who comes by during the night too.
? Space event: players make the tree sneeze to make other players fall off.
? Space event: the Fluff Airline, where players choose a dandelion that will take them to another part of the board.
? Space event: Woody, a day-time only event, about to give coins to players.
? Space event: Warukio, a night-time only event, about to take coins away from players with Spiny Eggs.
? Space event: Bees attacking players that can deduct coins. This page was last edited on April 19, 2019, at 21:28.